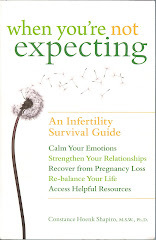 Since the recent publication of my book When You're Not Expecting, many people have approached me to ask about the counseling experience: How to know when counseling is a good "next step," how to access a counselor experienced with infertility issues, what costs may be involved, and what to expect of the counseling experience. The common thread that seems to be present in these conversations is " Since I feel like I'm going crazy, is counseling likely to be of any help?" These are very important questions. Since I have provided counseling to hundreds of couples and individuals grappling with infertility, I know all too well the kinds of barriers that can prevent people from seeking help for the emotional fallout of infertility. In the coming weeks I will devote several blog posts to various dimensions of infertility counseling. Today we'll begin with how to get started in this process. First, I think readers would agree with me that the infertility experience is filled with stress. Who to tell, how much to tell, how to cope with the fertile world, how to communicate with loved ones and health care providers, how to juggle treatment and personal life and, above all, how to bear the interminable waiting. This list could be much more extensive, but you get the idea: it doesn't take long for infertility to become a ruling force in your life. And this is an experience for which you probably have had no preparation. This also is an experience for which you lack a road map, so looming out there in the future is the fear of the unknown and whether you'll have the emotional strength to emerge from the infertility journey unscathed. Anyone who has been infertile for any period of time will be quick to say that the experience changes you. The question you will want to ask yourself is: at what point in this process do you want to seek out a counselor to help you cope more effectively with the inevitable stresses? Knowing that infertility will change you, do you want a counselor by your side to help you find new ways to handle the present and to think about the future? And do you see counseling as something for yourself, or is your partner also interested in being involved? Since I happen to be a believer in keeping a finger on one's emotional pulse, I would first encourage you to discuss with your partner how each of you is handling the stresses of your infertility. What are those stresses for each of you? What do you find difficult to discuss with one another? What are your worst fears about the way infertility will affect you? What sources of support do you have? And there are probably other questions that will come into your conversations once you begin this process. If you find yourself talking pretty openly and honestly with some degree of hopefulness, then you can give yourselves high marks for empathy and self awareness. You should make your own assessment about whether any issues are causing you emotional pain and, if not, there are several options to consider. First, continue to keep open communication with your partner about these topics. Another is to join a local infertility support group. RESOLVE's website http://www.resolve.org/ lists support groups by regions in the US, and the Infertility Awareness Association of Canada (IAAC) http://www.iaac.ca/ does as well for Canada. In addition, many communities have their own peer-led support groups. And, further, many infertility clinics offer support groups for their patients. A third option is to make an initial appointment with an infertility counselor; this will give you an opportunity to check out whether this is someone with whom you feel comfortable and with whom you believe you could communicate about difficulties when they arise. It will give the counselor an opportunity to see you and your partner at a time when you are managing well. It will give all of you an opportunity to discuss the likely future availability of the counselor, as well as practices that you need to know about: fees, insurance coverage, length of sessions (usually 50 minutes), whether the counselor has a preference for working with individuals vs. couples, etc. If this visit does not make you feel as though this counselor is the person with whom you would like to work in the future, then continue your quest until you find someone in whom you have more confidence. Waiting for a crisis is no way to pursue this quest. So, what if your conversation with your loved one is filled with fears, misgivings, tears or apprehensions on at least some of the topics you are discussing? This would suggest to me that at least one of you is hurting, at least one of you feels inadequate or confused about how to soothe your partner, and at least one of you is feeling emotionally overwhelmed on some level. Whether this means that you rarely discuss these issues with one another (usually for fear that the tears will turn to torrents), or that you are often reaching out for comfort that cannot be met by your partner alone, these are signals that you need more emotional support than you are getting. Counselors are accustomed to having clients who are tearful on their first visit, who say "I think I'm going crazy!" by way of introduction, and who are searching for coping skills that elude them in the midst of their infertility. So if the description in this paragraph feels familiar, your options would include inquiring about whether your infertility clinic or physician's practice can provide or refer you to infertility counseling services. If the answer is no, then you will need to do some detective work in your community to locate a counselor. Resources to help with this may include the medical social worker at an area hospital, your religious leader, any infertile friends in whom you have confided, as well as listings that may appear on the websites of RESOLVE or IAAC. Even contacting a number listed under "mental health services" in the yellow pages or googling infertility counselors with the name of your town may yield one contact number that could give answers to your questions about whether there are experienced infertility counselors in your community. This can take both time and patience, but it is well worth the effort if you connect with someone who can help you with the emotional burdens you are carrying. Some individuals or couples are so consumed with sadness and depression that it may take an emergency to jolt them and loved ones into recognizing the depth of their pain. Under these circumstances, when inability to function or a suicidal gesture are clear emergency signals, the path to help must be more immediate. Here is when an initial evaluation by a psychiatrist is an important first step, with the likelihood of prompt follow up by a mental health professional. The initial contact may be through a telephone call to your local mental health clinic where you firmly request an immediate appointment (that very day) or, if that is not successful, a trip to the emergency room of your hospital where a psychiatric evaluation should be available. It is far more important to get immediate services in a crisis, and ultimately to learn about the counseling resources in your community once the initial crisis has been addressed. Psychiatrists, who are medical doctors, can offer mental health diagnoses and can write prescriptions for anxiety, depression and other conditions. It is important to inquire of the psychiatrist, and of your pharmacist, about the effects of any prescribed medication on a developing fetus. Some psychiatrists offer counseling, but it is more likely that a psychiatrist will refer you to one of the professionals listed below. Psychologists, who have master's degrees and often Ph.D.s, cannot prescribe medication. They have counseling expertise gained through their education, internships and post-degree supervised clinical experience. Social workers, who have master's degrees, have acquired their counseling expertise through clinical supervision during internships and possibly post-degree experience. Social workers often have skills in individual and family counseling, promoting couple communication, addressing issues of loss, advocacy and helping clients to find appropriate community resources. Marriage and family therapists, who have master's degrees, have acquired their counseling expertise through clinical supervision during internships and possibly post-degree experience. They provide individual counseling, couple counseling and family counseling. It is possible that any of the counselors listed above, who are licensed in their state of residence, may be eligible to receive insurance reimbursement for providing services to you. This differs in each location, and a call to your insurance provider should be able to determine whether the counselor is considered a provider in their system. If money presents a barrier, there are several options you can pursue. You can ask a counselor whether s/he can offer you a sliding fee scale (this means fees will be flexible depending on your financial circumstances). If individual counselors in your area cannot offer this flexibility, sometimes agency counselors (at Family and Children's Services and Mental Health Agencies) can offer a sliding fee scale. Should none of these options be available, I would suggest a very open conversation with your counselor about an initial partial payment plan, with a repayment plan built in. Another option might be to see the counselor less frequently than weekly, thereby incurring less cost. I know for any readers who looked at my "getting started" title and expected to whiz through this blog, you might be feeling as if there's a lot to this process. But remember, what I have tried to do here is to depict the process in enough detail so that you could see your own circumstances in the options I am presenting. So, in truth, you don't need to digest everything in today's blog -- just the parts that apply to you. And, while you're digesting, I'll mention that my book offers therapeutic tips at the end of every chapter. So while you are considering whether/when to seek a counselor, you may find the book helps to acquaint you with the process of learning effective coping and communication skills over the course of the infertility journey. In my next blog I'll review what you can anticipate from the counseling experience, so you can feel more familiar with what to expect. Infertility counseling can help most couples that are going through fertility treatment programs. There are two types of counseling that an individual or couple may be looking at for fertility assistance. Women with Infertility: We're Everywhere!